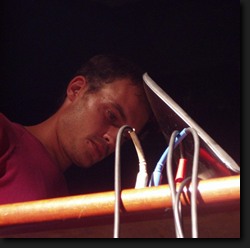 Working with minimal means Matthew Earle creates radically stripped back sound, improvised composition with blank media. Co-founder of improvising psychadelic rock outfit the Minerals in the mid 90s with Adam Rashied, he is currently playing in Stasis Duo with Adam Süssmann. He regularly collaborates with other improvising musicians and has toured through Japan playing the meeting at ‘Off site’ series solo 2003 and Cafe Futuro with Koike Toshihiro, Ezaki Masafumi & Takashi Kojime.